Verde is ‘green’ in Spanish and this dish is VERY green. The processed parsley and green onions put a great color on these shrimp. This is one of those restaurant worthy dishes – and it only takes minutes to prep ! 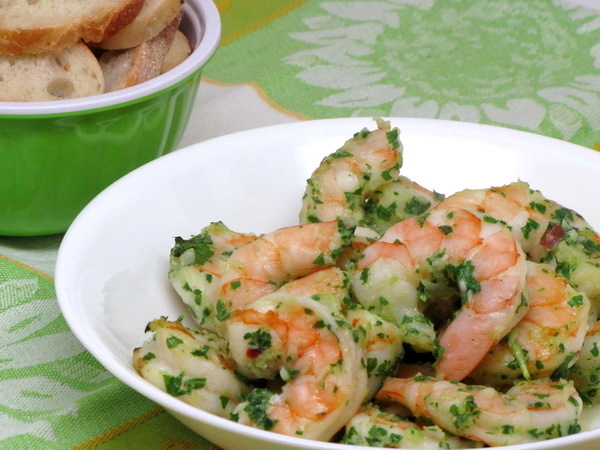 Cut out the bread and you cut out tons of calories here – shrimp are very low cal !! Preheat oven to 500 degrees. Place oil and garlic in food processor and process until garlic is fine then add onions and parsley and process again. Place in a bowl and add salt and peppers. Add shrimp and mix to coat. Place in a shallow roasting pan and add wine. Bake 7 – 10 minutes or until done. If the shrimp are not in a single layer, you may want to stir halfway through to ensure even cooking. Serve with bread for dipping in extra sauce. Combine cooked chicken and half the salsa verde in a skillet and heat through . Combine beans and the other half of the salsa, lightly mashing some of the beans with a fork. Microwave for 30 seconds to heat. Spread the bean mix over each tortilla and then the chicken mix and then sprinkle with 1/4 c cheese. Fold in half. Spray skillet with Pam and heat to medium high. 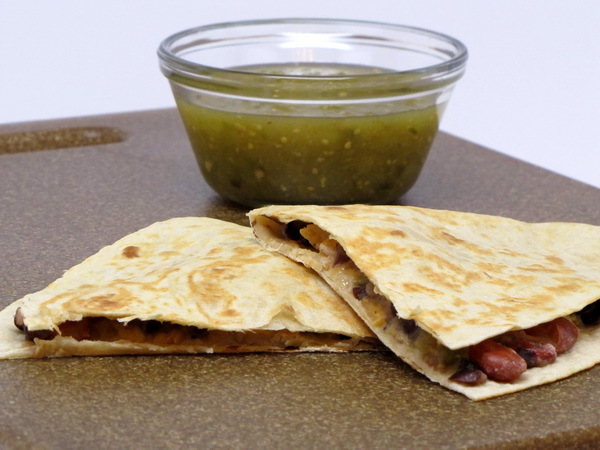 Add quesadillas and cook 2-3 minutes each side or until lightly browned. Serve with additional salsa.